This Site belongs to The Hills Group Ltd, a company registered in England and Wales under number 01478385 and whose registered office is Wiltshire House, County Park Business Centre, Shrivenham Road, Swindon SN1 2NR (“Hills”). The legal information appearing below is provided by Hills for the benefit of Hills itself and also its officers, employees and agents and subsidiaries and their officers, employees and agents from time to time. This website may at times store and/or capture personal information where these have been supplied willingly by you as a web user. We will only use the personal information you provide to respond to specific enquiries about our business or to contact you about our products and services and future promotions or news which maybe of interest to you. 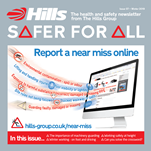 By providing these details you agree that we can contact you to advise you of such matters, however you may email us at info@hills-group.co.uk to request that we no longer send you this type of information. Click here for our general privacy statement.